The Huffington Post continued the discussion with a slideshow of re-imagined covers of famous books written by men but designed as if they were written by women. It was brilliant. I’ll admit that I had never noticed this, um, I’m going to call it a “point” instead of a “problem,” as I’m still not sure it’s something to complain over—anyway, I’d never really noticed this point until it was brought up. But even in discussion, I’m just not convinced this is an actual thing. It seems like it would be more common and concerning in the Young Adult book market, where growing teens are extremely concerned with gender stereotypes and may actually judge a book by its cover. But in a market for grown-ups? Eh. As an example, I’d like to present one of my all-time favorite book. 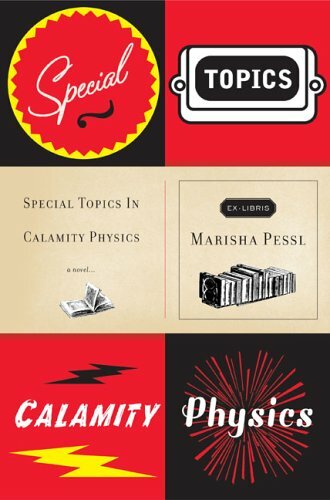 Not by a woman, but just ever, and it happens to be written by a women: Special Topics in Calamity Physics by Marisha Pessl. Definitely not a girly cover. Comments are there below for your views. Discuss!